So, it’s a celebration time. Christmas and New Year eve are around the corner. Planning a party at your home and want it to be the best. It is obvious that without any game in the party it’s almost impossible to have fun and enjoyment. At B.A.M casino parties, you have a privilege to enjoy your party at the home or the desired location. We provide casino equipment, gaming tables, and our professionals help you to host a party from a scratch till the end. Our professionals will provide you with each information desired by you and will help you implement your ideas to make your party a successful one. The casino games include craps, blackjack, roulette, poker, and other specialty games. Roulette is a wheel game that have players who place bets either on the colors (red or black) or may choose to bet on the numbers they wish. These numbers can be even or odd numbers. To determine the winning color or number, a dealer/croupier just spins a wheel in one direction and then spins the ball in the opposite direction around the titled circular track. The ball slowly loses momentum and falls to the wheel and into any number from 1-37 or any color. The betting areas consists of inside and outside areas. The inside area contains the individual numbers on the layout. The outside area has red/black and odd/even or different group of numbers. The numbers on the table are arranged in 12 rows of three numbers forming column 0 and 00 area at the top of the columns. The pockets of the roulette wheel are numbered from 0 to 36. The numbers from 1 to 10 and 19 to 28, odd numbers are red and even are black. The numbers from 11 to 18 and 29 to 36, odd numbers are black and even are red. Also, there is a green pocket that is numbered zero (0). In American roulette, there is a second green pocket marked 00. 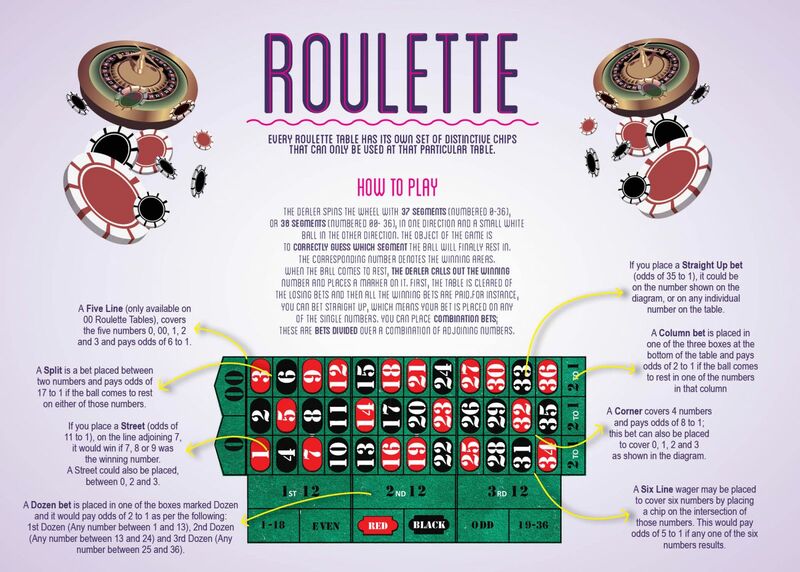 Roulette game has too simple rules and is easy to play. The best part to go with the roulette is that both the experienced and the beginners sail on the same boat and have the same chances of winning. It’s all a matter of good luck. In most of the games it’s always the matter of practice but when it comes to roulette, all you need is bankroll, and the strategy to make your bet to get the results you wish. There are various bets in the game that the players can make to win. These includes inside bet and outside bet. Here’s a treat for the players. You can make several inside bets. A player can bet on any number straight up or straddle the line between numbers to select a combination of numbers. Straight Up Bet: A wager on a single number and it pays 35 to 1. Split Bet: A wager on two numbers and pays 17 to 1. A player can make this bet by placing your chip so that it is in the line between any two numbers. Line/ Street Bet: A wager pays 11 to 1. A player can make this bet by placing a chip on the vertical line separating the inside and outside betting areas. Corner Bet: A wager pays 8 to 1. A player can make this bet by placing a chip in such a manner that it touches the four corners of the numbers they are betting. Basket Bet: It is a five number bet on zero-double zero and the numbers 1-2-3 that pays 6 to 1. Double Street Bet: A wager on 6 numbers and pays 5 to 1. A player place a chip on the line separating the inside and outside area, as you do for the line bet but it also straddle the row below and above. It’s still not the end of the bets. Players have different chances to place the bets as they desire in the game. These are the bets made in the boxes surrounding the numbers. Black Red Odd and Even: All are money bets. Just place the chips in the boxes on the layout. Column Bet: This is the 12 number bets. These are the numbers in one of the three vertical columns. Place your wager in the boxes at the bottom and these bets pay 2 to 1. Dozens Bet: The bet is made on the 12 consecutive numbers. Place the wager in the boxes marked 1-12, 13-24 or 25-36. These type of bets pay 2 to 1. Please note if 0 or 00 come up, you lose. In Roulette, keep in mind that a player is allowed to place bets till the dealer calls out, “No more bets”. Are you Planning your next big party or casino fundraiser in San Francisco? Looking for a fun idea or theme for your birthday party, prom party or grad night? Want to add some excitement to your company party or corporate event? Add some electrifying casino night entertainment with BAM Casino Parties. Let one of our casino party experts help you plan a memorable casino event that your guests will be talking about for days to come!